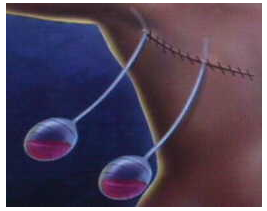 After my double mastectomy, I left the hospital with two drains, one under each arm. The management of these two drains has been the worst part of this whole procedure. You wouldn’t think two little drains could be so uncomfortable, limiting and down right annoying but they were. 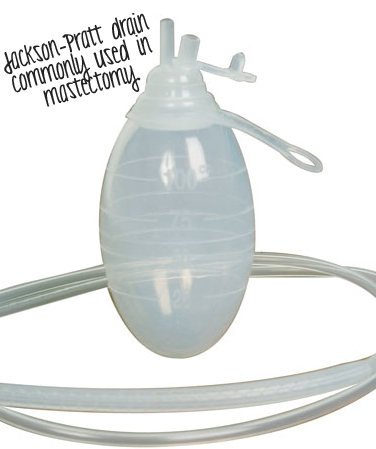 The type of drains I had are called Jackson-Pratt or JP Drains. The drains were literally stitched into my skin. Every time I moved my arm the stitch would pull. It was not pleasant. I couldn’t wear shirts with sleeves very well so I was living in Hanes men’s tank tops. They were large enough that I could step into them so I wouldn’t have to raise my hands over my head. These tanks were a great minimal investment. They were very comfortable and cheap so I didn’t care if they got stretched out, bled on or anything else that could damage them. 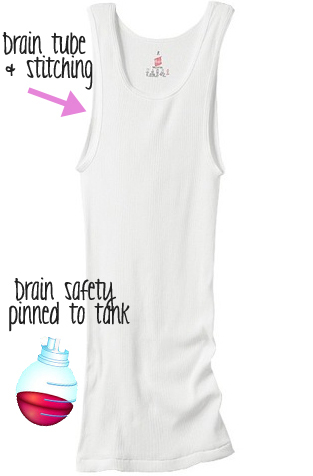 I couldn’t have the tube of the drain on the inside of the tank top because it tugged at the stitch. So I had to have them on the outside. I simply pinned the drain to the bottom of the tank. It worked perfectly as the arm cut out of the tank was low enough that it didn’t rub against the drain tube or stitching. I did have to be really careful though as one drain got caught on a chair. Ouch! And apparently I’m not a quick study as the same drain got caught on a doorknob about a week later. Thankfully neither incident resulted in the drain being pulled out. Well done stitches! Well done! I found this handy little drain belt after the fact of course but I really like those tanks and continue to wear them every day. My plastic surgeon said to wait 48 hours, but that I could shower with the drains after that. I hear time and time again from other women that their surgeon said no showering with drains. Each seem to have their own guidelines. I was able to lean over the sink and wash my hair for the first week or so. During that time I also sat in the tub to bathe but never submersed my upper half. I just used a washcloth sort of like a sponge bath. Now this sounds crazy and I’m sure it looked just as crazy as it sounds, but when I sat in the tub, I pulled my hair in a low ponytail and took two long hair pins and secured each drain to the pony tail. That’s how I managed the drains while in the tub. By the second week with drains, I decided to follow my surgeon’s guidance and showered with the drains. I took a cloth white ribbon and tied it around my neck. I then safety pinned the drains to the ribbon. It worked like a charm! Again, I looked completely ridiculous but felt like a new woman after that first shower since the surgery! 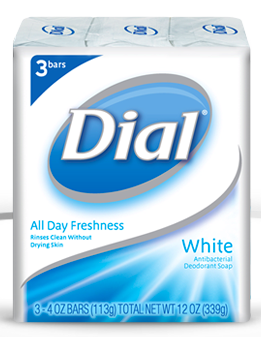 A week before my surgery and for a couple of months after, I only used antibacterial Dial soap. I did shampoo my hair in the shower but only used conditioner if I washed my hair over the sink. I was afraid that the conditioner may possibly cause an infection if it got to my incisions. Most people get their drains out in 5 to 10 days but mine were in for three long weeks. No matter what I did or as little activity that I had, I simply couldn’t get the output down to less than 30ccs in a 24 hour period which was required for two consecutive days before they could be removed. The last week I never had an output more than 32ccs over a 24 hour period of time. I was just hovering around 30. Seriously, I can not tell you how many days 1 tiny cc of fluid dashed my hopes of getting these darn things removed. But I was taking no chances of having the drains removed too soon and risk my reconstruction due to an infection or complication such as seroma. It was decided at the three week mark however that the risk of infection now outweighed the benefit of the drains. So the surgeon decided to remove the drains. Hallelujah!! The surgeon’s PA both removed the drains and completed my first fill at the same appointment. They felt giving the fluid less room to collect by beginning to fill my tissue expander was a good idea and it worked. I never had any complication even though I was still outputting around 30 to 32ccs a day. My breast surgeon mentioned that sometimes the drains themselves are the culprit for the continued drainage. I’m not sure what caused it but I was so grateful to be able to move forward without these drains. I shouldn’t really complain. There are plenty of women who have had it much worse. But I think we would all agree; drains are evil. A necessary one but evil nonetheless. Agreed Carr! It is odd to have these things hanging from you. I hope you’re doing well! Very interesting to know. I didn’t know that they used those drains for that. I had a drain in my leg when I had cancer surgery. I had it for 2 or 3 weeks. Since most of or all of the nerves were gone in that area after the surgery I didn’t feel any pain. Mine filled up alot more than they expected. I thought that was helpful getting rid of the junk. How creative you were while bathing. Yes, sorry but that did sound funny. I would have to agree…I hated my drains! My two drains were on one side, just like your first picture. What a pain they were…and I had no idea that I would have them! You are doing a wonderful thing by writing about your experience. I’m sure your posts will help other women who are thinking/going through the same process! The drains are more annoying than anything! My left side wouldnt drain so two days in a row i had to go in and manually have it drained but yesterday they syringed out about 100cc and let me take the drain out. Something about the drain not doing its job anymore because the fluid was behind the pectoral muscle. I also had 30cc of saline added. My right side is draining at about 33cc so we are hoping it will come out tomorrow! Cannot wait! My doc did go ahead and insert 30cc of saline in that breast as well. I cant believe you did 100cc. I am so so sore at 30!! Thanks for your blog! Im ready to be drain free! What a difference even removing one makes! Ladies you are all so amazing, I was blessed and only had my right breast removed, with out any lymph node involvement. I can’t even imagine having two drains, mine has been in for 45 days and is still putting out 50cc on a daily basis, although it only 3.5 hours since my morning drain and I have already accumulated more than 55cc, hope it is the final effort. and not something to be concerned with, am chatting with my doc this afternoon. God Bless us all. Try having 2 of these little gems under each arm. Talk about a pain. LOL How’s THAT for a double entendre ! I cut about 1″ off the bottom of one of my husbands tee shirts and made a belt to hang the drains on. This worked really well, soft, non binding and adjustable. I then put the rest of the cut off tee shirt on and over the drains, this worked out very well for my chest sore and I felt chilly. The nice part of the tee shirt idea, you can wear it in the shower and put a dry one on when your finished and it’s cheap. Good luck, this HAS been an experience that I never thought would happen to me. I’m 81 years old.